Colin Powell has officially endorsed Barack Obama for President. But the big news is that this was not even his most important endorsement of the day. As it turns out, the most important thing endorsed by Colin Powell today was an America that's worth leading and worth fighting for, an America that encapsulates the idea of what some might call a "more perfect union." To that end, Powell invoked a picture to illustrate his point. "Is there something wrong with being a Muslim in this country? The answer is no. That's not America. Is there something wrong with a seven-year-old Muslim-American kid believing he or she could be president? Yet I have heard senior members of my own party drop the suggestion that he is a Muslim and might have an association with terrorists. This is not the way we should be doing it in America. I feel particularly strong about this because of a picture I saw in a magazine. It was a photo essay about troops who were serving in Iraq and Afghanistan. And one picture at the tail end of this photo essay, was of a mother at Arlington Cemetery and she had her head on the headstone of her son's grave. And as the picture focused in, you could see the writing on the headstone, and it gave his awards - Purple Heart, Bronze Star - showed that he died in Iraq, gave his date of birth, date of death, he was 20 years old. And then at the very top of the head stone, it didn't have a Christian cross. It didn't have a Star of David. It has a crescent and star of the Islamic faith. 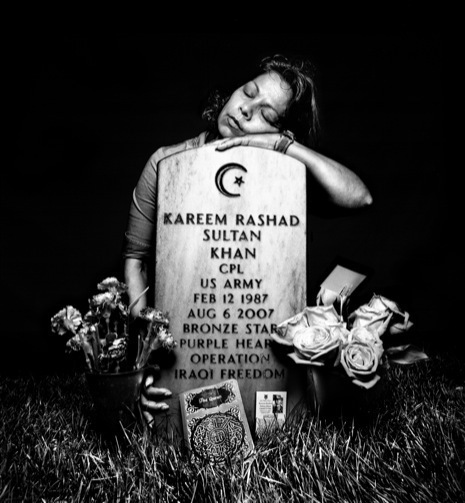 And his name was Kareem Rashad Sultan Khan. And he was an American. He was born in New Jersey. He was fourteen years old at the time of 9/11, and he waited until he could serve his country and he gave his life." So, yeah. Sometimes, America does benefit when we share our wealth with one another. And some people, in fact, do have it harder than Joe The Plumber.